NATO is a mutual defense treaty among allies. It has no plan to hire the USA as mercenary fighting troops to defend Europe. If Trump wants the USA to work for NATO and get paid like a mercenary instead of an equal partner in regional security, just say so in front of her. Trump can immediately withdraw from NATO if he does not want the USA to defend North Atlantic nations. 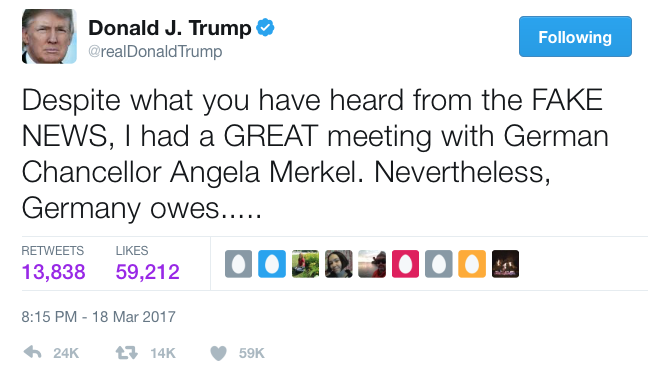 No country, including Germany, owes any money to the US or NATO. NATO members pay their fair share according to formal agreement requiring countries to contribute in proportion to the country’s GDP. NATO is not Mar-a-Largo where members pay the same annual fee regardless of their personal wealth. 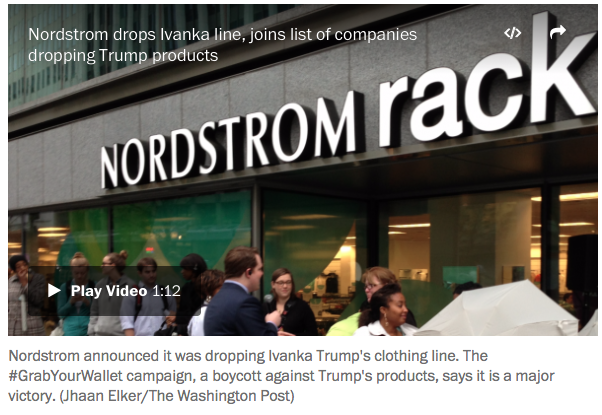 Donald Trump tweeted attacking Nordstrom Department store company in defence of his daughter, Ivanka: "My daughter Ivanka has been treated so unfairly by @Nordstrom. She is a great person -- always pushing me to do the right thing! Terrible!" 10:51 PM - 8 Feb 2017. 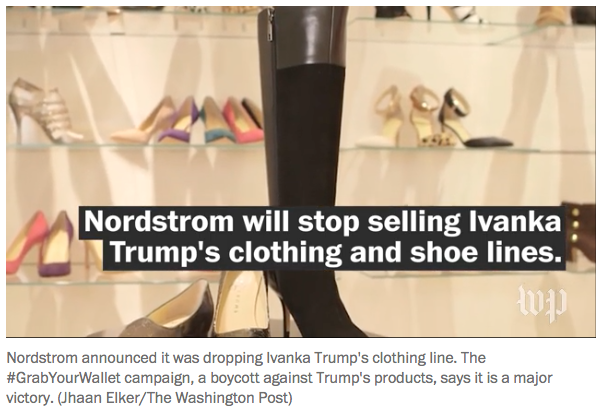 Nordstrom stopped sailing Ivanka brand product due to dismal sale. 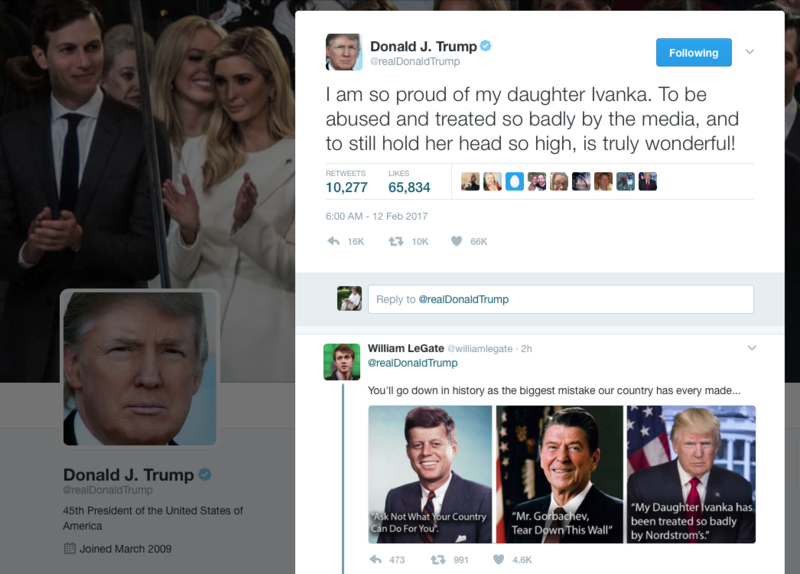 "I am so proud of my daughter Ivanka. To be abused and treated so badly by the media, and to still hold her head so high, is truly wonderful!" 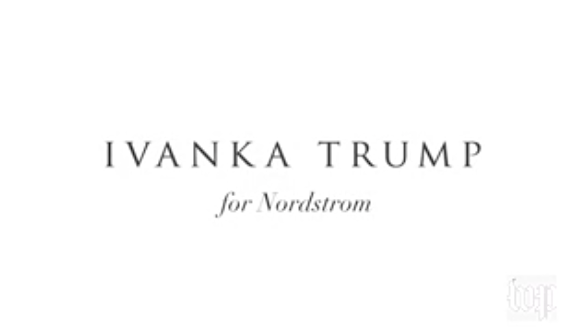 "I am so proud of my daughter Ivanka. 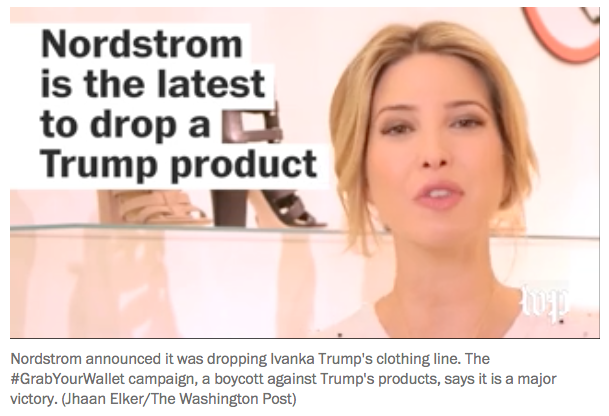 It's truly wonderful that my daughter Ivanka was abused and treated so badly by the media. White House News Conference: Trump, blaming Obama, said: “To be honest, I inherited a mess,”...“It's a mess. At home and abroad, a mess. Jobs are pouring out of the country.” - Not true, President Obama inherited economic mess from G.W. Bush and improved it in eight years. Employment figures and growth rose far better than expected. 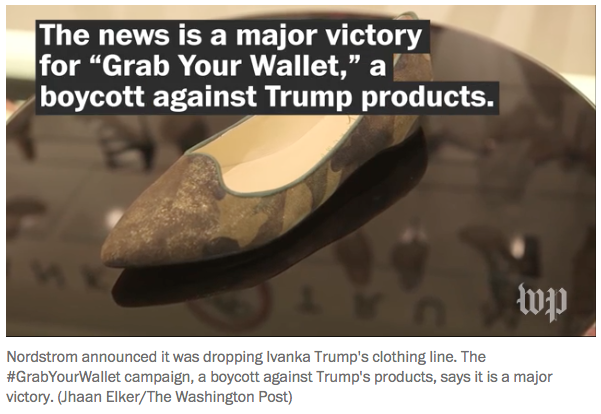 Whatever Trump has inherited is a better economy, not the best, but far better than expected. Trump just needs to improve over it a little and he'll be OK. It doesn't appear at present present. His White House politics and his pathological lies are making a big mess. The American carnage made by Trump is beginning to show. 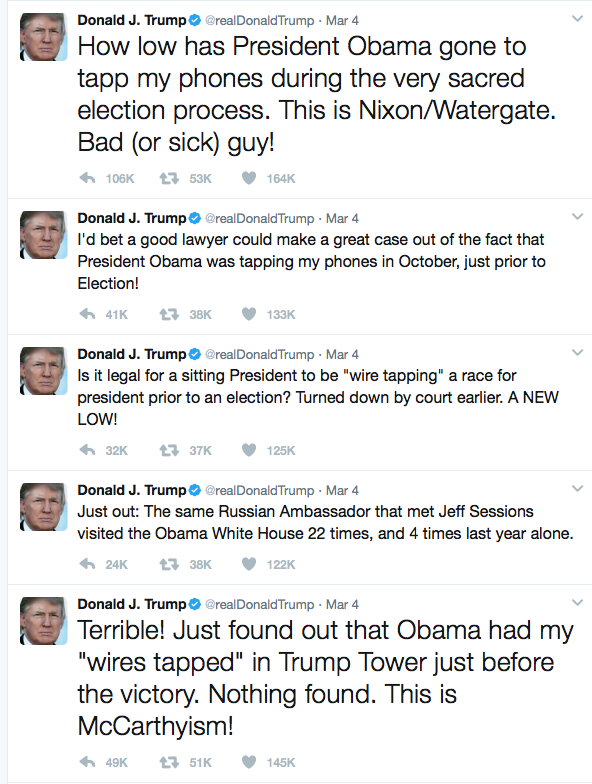 (trump usually ends his tweets with "bad dude", "bad hombre", "sad", "horrible" - take your pick!